Kids have a way of imitating their elders, especially with how they behave and how they react to things. One thing kids seem to assimilate quickly is the fondness with the comfort that a reclining chair like the Flash Furniture Contemporary Brown Leather Kids Recliner can give. This particular recliner is designed for enterprising toddlers and kids that want to feel comfortable while watching their Saturday morning cartoons, or their favorite noontime movie. Yes, recliner chairs are no longer limited to adult use, even kids can now use them when they want. Which is all good as you will be able to give your kids something to use while preserving the quality and sturdiness of your own reclining chair. It’s a win-win scenario, right? This recliner chair is a wall saver type which only tilts a little backward but fully extends the footrest forward for a comfortable position. Tthe Flash Furniture Child’s Recliner comes with plush padding that is soft and comfortable, while the upholstery is equally soft to the touch and non-abrasive. The plush padding ensures that your kid enjoys their movie and naptime while you lounge on your adult-sized recliner. This reclining chair comes with an oversized headrest that complements the entire set-up, and it also comes with an additional headrest cover for days when one kid is worth ten. The upholstery of the Flash Furniture Child’s Recliner is easy to clean and maintain. Just wipe a damp cloth on the surface to remove any food remnant, dirt, and grease left behind after a day’s worth of play. Like an adult’s recliner chair, the Flash Furniture Child’s Recliner comes with a cup holder that is strategically placed on the armrest. It can fit a feeding bottle, a sippy cup or your kid’s favorite brand of soda. The frame of this recliner seat is made of solid hardwood for that extra durability. It is also raised a little higher from the floor using black plastic feet to ensure stability, and it also makes raising the footrest easier. The Flash Furniture Child’s Recliner has a weight limit of 90 lbs which means it can carry a child until they are about five or six years old, depending on their size and rate of growth. Grade CA117 fire-retardant foam is used as padding for this reclining chair. The vinyl cover of this recliner is easy to clean, you just have to wipe the dirt off, and you’re done. This recliner chair comes in different colors that are attractive to kids and can match any color scheme usually found in a playroom. The cup holder is perfect for reminding kids to drink their water regularly. It is also tight enough to prevent bottles and cups from being tipped over. The chair is easy to assemble, and it takes less than ten minutes to build it right out of the box. The reclining chair has a good frame, and the upholstery seems to be durable enough to withstand the pressures of being a kids plaything. 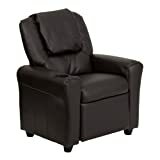 The bottom section of the recliner chair is hard to reach and clean as the bottom seat pad cannot be removed. The footrest and back of the chair do not lift easily, even if an adult is making all the effort. For a recliner chair, this one does stay reclined for a long time, so a lock is probably needed. This kid’s recliner is a little small for its weight capacity as it already becomes too small for kids aged three to four. The features of the Flash Furniture Contemporary Brown Leather Kids Recliner is a little hard to beat with the armrest cup holder and oversized headrest that make playtime extra comfortable and hassle-free. The upholstery is easy to clean with a damp cloth, making mom’s life easy, and the solid hardwood frame ensures that the chair can survive the stresses of early childhood. The fire-retardant foam and plush padding are nice additions to the overall package and, being a wall saver recliner; it means that the recline is not like that of an adult’s. The extended footrest creates extra leg room for your kids when they’re lying down for their nap, while the raised feet makes it easy to clean underneath. The Gentle Shower Kids Recliner has features that come close to that of the Flash Furniture Contemporary Brown Leather Kids Recliner, especially the armrest cup holder, the extended footrest and the raised feet. The Gentle Shower chair is built using a strong wooden frame and covered with the 25D sponge and PU upholstery. The rated CA117 foam inside the Flash Furniture chair is strictly better than the 25D foam inside the Gentle Shower chair as it provides additional protection and ensures that the foam can withstand tough environments, like a kids playroom. Although PU leather is a little more stylish than that of vinyl, the easy-to-clean property of the Flash Furniture chair makes your life easier come clean up time. Repeated wiping with damp cloth might lead to corruption of the leather fabric, but the Flash Furniture chair seems to last a long time. Kids like imitating grown-ups, especially in things that they find fun and comfortable. This is why some kids would prefer sitting in dad’s chair or wearing mom’s clothes. They find it comfortable and familiar. With this reasoning, it should be no surprise that this would extend to something trivial like a reclining chair. But then again, why deny them the chance to experience the relaxing comfort of a reclining chair anyways? What can be more enjoyable than watching them sleep in a similar chair that you’ve taken a nap in? What better experience than to watch a movie on different-sized reclining chairs together? These are the best times for you to bond with your kids as they are still in their formative years and doing so in comfort is always the best way to do it.